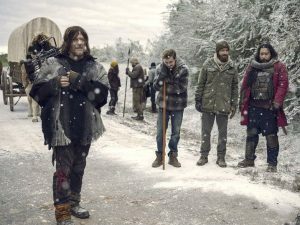 Pressed by a dangerous blizzard, Ezekiel and Carol evacuate the Kingdom -- but face a potentially fatal crossroads on their journey to a new refuge. Last edited by GateWorld; April 4th, 2019 at 12:21 AM. I think I took a few years watching that episode. Honestly I think this has to be one of the most boring finale I've ever seen in my life. Like literally nothing interesting happened other than the dog running off, which is my favorite character in the show. Glad he's okay. Oh I wasn't bored at all. I loved it. The only thing I didn't like was right near the end when we popped back to the Whisperers in the woods and there was no snow at all and a dismissive "some time away was good" line. Really dismissed the rest of the episode IMO. And I want more winter episodes. They don't need to be snowstorms, just a whole bunch set in the winter. I'm just glad Dog is okay. Honestly if they kill him I'm done with this show. Also, was that Maggie at the end on the radio? But as we know, they like to take comic stuff and give it their own twist, so it may well end up being a totally unexpected twist on what I’m anticipating! Why not use Metal Storm?